There are many 'photographic mentoring' schemes available, some are good and some are just downright awful. 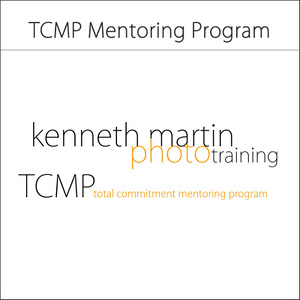 BUT the 'TOTAL COMMITMENT MENTORING PROGRAM' by Kenneth Martin is another level. Yes it's the most expensive you will find, yes it's incredibly hard work and yes there are no guarantees of success. I can't tell you there is, because I would be lying. The success or failure will be down to YOU!! I The tools and method is sound, you along with me need to make it work, how? Simple - Total Commitment to the task!!! Read the Testimonials and make you own mind up. If you want to speak to any of the studios, please let me know and I can put you in touch so you can hear it direct from them. The TCMP is a small group of photographers who under my guidance will, over a period of 12 months, aim to move the portrait side of their businesses to a whole new level. The term ‘Total Commitment’ is aimed at both the studios and myself. In essence I will be a part of your business for the whole 12 month period and after that period, if you feel it necessary, will of course be available for less frequent studio meetings or even another 12 month extension of the TCMP to keep the momentum going. I will stress at this point that this is NOT ABOUT A QUICK FIX, if you want a quick fix, you just need leads, that’s easy, I could fill your studio with plenty of these, they will get you through a spot BUT will do your long term future no benefit. The first meeting is a detailed analysis of the business: premises, location, staffing, pricing, products, photography, management style, workflow, routes to market etc. The next meeting I devise a business plan and cash flow forecast for the next 12 months to 5 years which will be signed off between the studio and myself. I will also install Analysis Software so I can keep the studio, and myself, right on track with up-to date stats regarding volume, averages, lead stock etc. Through the 12 months we will cover Business Planning, Branding, Look and Feel, Pricing, Products, Styles, Routes to Market, Telesales, Reception, Vouchers, Photography (Lighting, Variety, Enjoyment etc) Sales Techniques, Management Structure, Studio Management Software and much more asides. A complete analysis of the business will be made and each month and action points will be issued to be undertaken by studio owners and staff. The aim is to meet and exceed the business plan, create stunning average orders, get a steady stream of good quality clients, give you something to be proud of, make good profit for your company and an excellent standard of living for you and your family. This is a long hard road, it is a journey that will push you, will take you way out of your comfort zone, I will be on hand to help you through the sticky bits, I will never ask you do something I would not be willing to do myself and trust me there will be many of these sticky bits!! When I am not at your studio I will be available by Email, Skype and Telephone pretty much any time you need me. I will visit your studio once a month on pre-arranged dates which will be set for the year. Discounts have also been arranged with Loxley’s Colour Laboratory and other major suppliers. Due to the length of time, the structure and dynamics of the group and the fact that this is not about instant success but in the long term sustainability of the studios, I need all participating studios to agree to sign a 12 month legal contract that cannot be severed. This is important and is not only to cover the investment in time and effort but also for the fairness of the other members of the group who will be affected by anyone leaving early. If this feels a bit heavy, we are sorry, but I are sure you will understand why it must be a condition of the program. Five Studios signed up for the initial intake in 2013 and have now completed the course, many of them signed up to continue the course (see the Testimonials below) and we are deep into the second and 3rd intake of the 2014 / 15 delegates, it was expected and it has become apparent that this process is a long one, the studios are just now starting to see a difference, the general consensus amongst the studios is the early pain of trying to change things and move the business onto a more secure footing is worth it and the investment in the program is not about a single year it’s about the rest of the studio’s life. This makes the Total Commitment Mentoring Program one of the most powerful, effective and cost efficient available anywhere in the world. I always get considerable interest about the TCMP and have studios on a 'waiting' list for the next group. Now the studios are more staggered I have studios finishing the course at different times throughout the year so there is always an opportunity to apply and be selected fairly quickly or it may be 6 months before we can get a start date, if you need urgent help please ask. The criteria for applications is simple - No studio within 75 miles of Edinburgh, the applicants must have a studio location (not working from home unless it is a custom built professional area, not a back bedroom!! ), the applicants must be available 1 day every month, planned 12 months in advance for the meeting, the applicants must follow the program to the letter as this is the only way I can guarantee success after the 12 months are complete. How will the studios be selected? What I need from you is this: We need to be 100% honest, if not I cannot help you, I am not here to judge, I am here to help you achieve more in your business. If you have particular monetary difficulties please speak to me I might be able to help, I have in the past attended bank meetings and rent reviews with TCMP members and so far I have succeeded in what we set out to do. •	Any other info you think would be useful to your application. We do hope you will take your interest in the TCMP further, if you wish to chat to me please feel free, if you want to be considered for membership I look forward to receiving your application. If you would like to talk to existing and past TCMP members I can arrange that, please let me know. The cost of the Full 12 Month 'Total Commitment Mentoring Program' is only £1,000 + VAT per month paid in advance by Direct Debit on the 1st of the month. Travel, accommodation and expenses are covered by myself. "It’s fair to say that Kenny’s input through the TCMP program has been critical to our business. We opened our studio in June having had several TCMP meetings in the months leading up to our launch. It was invaluable having Kenny there to guide us through a viable business plan, lead generation, product selection, pricing structure, layout of the preview room, what samples to have and where to put them….. everything, in fact! Having the benefit of his experience allowed us to choose the right path in every area of the business and avoid some costly mistakes. We opened with a bang and had a very busy few months, but it wasn’t just bums on seats, due to the value chain being in place we also enjoyed some superb sales and an above-target sales average. In the months following our launch we’ve been able to concentrate more on the photography aspect and also tweak our processes and lead-generation strategy. Kenny continues to be a cornerstone of our business. It was a huge decision for a start-up business to invest such a sum of money each month, particularly before we had opened and weren’t earning anything! But we decided that we couldn’t afford NOT to involve Kenny if we were serious about being successful. It’s the best decision we have made so far. Our sales average remains above target and we keep on breaking our 'biggest sale’ record. "I fought with my husband (and business partner) for months over taking Kenny Martin on as a mentor. He was for and I was dead set against. How could we possibly afford to pay the fee when we were barely making enough to put food on the table. Kenny took the time to come and meet me and help me understand how he could help and why taking him on would be the best decision I had ever made. I hate to admit it (as I can already see the smirk on his cheeky face) but he was right. Having Kenny mentor us has given us the drive to carry on. The drive to keep the doors open and to work harder than I ever thought possible. He has educated us, encouraged us, congratulated us, chastised us, has given us a right royal kick up the rear and in turn kick started our business again. From marketing to sales and everything in between, we have learned so much from him and our biggest testament is that our weekends are fully booked until February. It's the first time, in the life of our business, that we have had more than one booking in our disaster month of January, let alone be full. Thank you Kenny. Thank you for giving us our beloved business back." "Hi Kenny! First of all I have to thank you for all the help and support you given me and my studio; i can't beleve that it took me almost 4 months to take the decision to start work with you and the TCMP mentorprogram. Had to think about how much time and money I was able to invest. Good thoughts but a waste of time, if I knew what should happen since you have arrived I would have jumped on it earlier. Has been a lot of hard work, yes indeed. But I was already hard working, the difference now is that I get payed for it! Joined your mentor program in June , and now in the middle of November I have à bigger sale than ever.. Had to get one more person employeed a few weeks ago so we should be able to handle all our customers! I now look forward to go on with our plan to spend more time in the studio when you come back here next time, I want to become a better photographer. You are very engaged Kenny, the Total Comittement really works both ways! Have been to so many seminars in the past, made notes and fully intended to make some changes........ Never happens!! He has motivated my staff as well as myself and am I pleased to say that sales have increased! "When I first saw Kenny’s post for the first TCMP course & inviting applications, things were pretty tough. Photography is my passion & I had been running All People Photography for 13 years, I consider myself very fortunate to be doing something I love so much as a job. I took on Michelle, my business partner in 2005. Sadly, we had been operating at a loss for some time. The portrait business had largely disappeared & we had become wedding specialists, though with the year 2013 being unlucky for some, even the wedding bookings had dropped off by 50%. It was early February, our accountancy figures were in & we had run out of money. The passion had turned to despair & I was ready to throw the towel in, as others in the business had already done. I knew I needed help, but wasn’t sure where to look. With a small studio on our local High Street, one simple option was to close the studio & operate from home, to at least save some pennies. Alex Polizzi had just aired her tv programme the Fixer, helping turn round the fortunes of a local portrait studio in Aylesbury. I remember feeling quite jealous. ”Why can’t we make it work?” I asked myself. We had a good product, good recommendations & our clients seemed to like us. We just need more clients… “I could do with a ‘Fixer’” I remember thinking. About this time we got an email from The Photographer Academy & somewhere within that was post from Kenny about the TCMP, inviting studios to apply. The timing seemed more than coincidence & I started to get excited for the first time in a very long while. I had already heard Kenny on one of the Business Class Webinars & warmed to his positivity & comments through the webinar. After a bit of research, I decided to apply. Always being cautious, I spoke to close friends & family I trusted about the idea, After all, £12k is a lot of money! I spoke with Kenny & he explained that he could turn things round, but it wasn’t a quick fix solution. Soon after I got the news - I was ecstatic to be accepted onto the program! So, being a risk taker, we went for it. Well, the course started 10 months ago & I can honestly say I don’t recognize myself or the business that it & I was before we started. We have just had our best portrait sales in the studio in our history, in historically the worst month of January. Kenny looked at every part of the business from the bottom up & has effectively rebuilt it. From how we shoot, the look of the studio, managing our client database, how we communicate with our clients, how we sell & how we market the business has changed, for the better. Before the start of the course I had settled for selling prints & discs – after all, any sale is better than no sales right? Wrong!! We now have regular £1k plus sales, something I thought was impossible a year ago. We have regular clients through the door & I have regained the passion & excitement I had when I started the business 14 years ago. Oh, & we don’t sell loose prints or discs anymore! Don’t do the course if you’re not prepared to be stretched & challenged & be prepared to put in lots of hard work. It has stretched us to our limits & we have had frustrations along the way. But, if you want your business to grow & to build a business that has sustainability & consistency, then go for it. I am now excited for the future, thanks to a wee Scottish man with a genuine passion to see our future improve. You have re-lit the flame Kenny & for that I will always be grateful. Go for it & let 2014 be the year of change!" "Kenny knows what he's saying and tailors his knowledge to suit your business. His experience and guidance have been invaluable to me and I really wish I could keep him on as a permanent guide! The TCMP could be exactly what your business is missing." "For the first year and a half since opening my studio two and a half years ago I was too busy with weddings to promote the studio, and my volume of paying portraits were virtually nonexistent, and average sales probably around £150. I needed to do something about that and signed up for Kenny Martin’s Mentoring Program. Over the last year Kenny has shown me how to develop my complete value chain, right through from first contact and lead generation, through to booking portrait experiences and selling. The number of monthly sessions that I’m now shooting are approaching the number I was doing annually a year and a half ago, and average sales are now three and four times what I was previously achieving, and growing nicely. This wouldn’t have been possible without Kenny’s expertise and guidance, and I would recommend him to any studio that really wants to get their business going." "Now I have only one month left of my TCMP - year. When we started in June last year Kenny told me that it would take at least six month to get everything going. And that I would need the rest of the year to get the real "flow". I am glad to get that perspective; I'm not known for being patience:). I have all followed his advice even thought our new price list (2-3 times more than before) almost gave me a heart attack. Even thought I spent much more time at work than in my home, because I said YES to everybody that wanted to book a session! I really needed the money! It has happened a lot this year, with the tools that Kenny gave me I have been able to do everything better. Have always loved to do the selling, and I get better and better results; yesterday I had four sales presentations. And they bought pictures for more than 62000 Skr!! (£6,000) It all works, if you do it properly, and if you go all the way! I am truly grateful for all that has happened this last year; Kenny's visits (that leave us all totally exhausted every time!) , hard work that payes off, the change of lab to Loxley and the fact that we are three people working here, not only me. Next goal is to be a better, much better photographer!!" "I'm in shock. Can't wipe the smile off my face right now. My biggest ever sale today from one of the promotions - £3950.00 and they paid in real £50 notes. Good job Kenny's not here today or I would snog him. Thanks for the support of everyone here as well"
For further information on how to be one of the chosen 6 studios for the coming year please get in touch by phoning 07921 556018 or drop me a line using the contact form.